I do not have a studio at the moment, so I come to you instead. That's right - I do house calls! Video chat readings via Skype or Google Hangouts. I will call or message you at our arranged time. Need a check-in? Looking for inspiration? We can either take an overall look at the energies surrounding you, or focus on 1-2 burning questions. In a typical 30 minute reading, we’ll flip some cards to shed light on what led you here, where you’re at, and where you might be headed. Are you at a turning point? Facing something big? Just looking for something more? This is a comprehensive and in-depth reading. Gain a 360 degree perspective and explore many aspects of your life – or reflect deeply on whatever it is you’re grappling with right now. 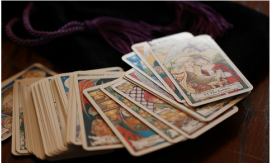 Tarot is an ideal process for developing genuine self-awareness. Have Tarot, will travel! For in-person readings, I will come to you if you live within my catchment area. That includes anywhere within the big blue circle below.